Trying to follow the Tampa Bay Rays Front Office is becoming more difficult as their “silence is golden” trade chatter blackout grip has become even more tight-lipped and further tweaked beyond any type of white noise in the last few seasons. Now that the Rays can effectively have out-of-sight, out-of-mind multiple Rays staffers and attorneys cloaked in darkness back in the Rays offices in St. Petersburg do a lot of the legwork out of the vision of any eagle eyed journalists or bloggers, getting any morsel or tasty tidbit is getting particularly difficult for us to supply to the Rays baseball hungry fans. And today’s announcement of the Rays signing the former Cuban National Team multi-positional player Leslie Anderson to a $ 3.75million /4 year contract, the signing had most of us online, and sniffing around the team’s Spring Training complex caught completely off guard by this Rays move. Most of the Rays Republic knew that the Rays had set their sights by offering a possible contract to fellow Cuban refugee Jose Julio Ruiz in February. And some people actually thought the Rays might have had an upper hand in possibly signing Ruiz seeing that Tampa Bay had the second highest Hispanic population in the Southeastern segment of the United States. The Rays presented Ruiz’s agent with a $ 2 million offer back in February, but with the recent hurricane brewing within Ruiz’s camp with his firing of his agent, and the ensuing turmoil, maybe the Rays quickly switched their previous focal point on Ruiz, and took another route without being noticed, and ultimately signed the versatile 27-year old Anderson. 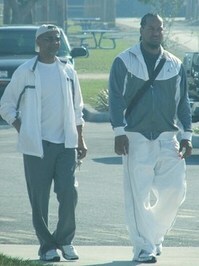 And the wild part is that Anderson, who is also a left-handed hitter like Ruiz, might end up being the most versatile of the two players having played both First Base and the Centerfield for Camaguey in the Cuban Baseball League before leaving Cuba in September and becoming available to all 30 Major League Baseball clubs this January. This signing might just be a great future insurance policy for the Rays since Anderson has been projected to be able to play multiple positions. And with the possibilities of Anderson also playing any of the three outfield positions, it increased the Rays appetite to include Anderson to their system. Most fans might remember Anderson has played Rightfield for the Cuban National Team during the last two World Baseball Classics. Before Anderson was moved to First Base while with Camaguey in 2009, he was the team’s starting Centerfielder and considered a great gap hitter with the potential for at least 15-20 Home Runs at the Major League level. And with Anderson’s potential to play all three outfield positions, plus First Base, Anderson brings to the plate another interesting set of future scenarios if the Rays can not entertain Carl Crawford or Carlos Pena to stay with the team when their contracts expire following the 2010 season. Anderson might actually be a more advanced in his plate discipline than Ruiz, and boasts some really impressive numbers while with Camaguey, where he finished fifth in the Cuban Baseball League with a .381 Batting Average. But more impressive still might be his almost identical numbers against left-handers (.379) and right-handers (.383) to show that Anderson might just be the great addition to the Rays future roster by showing superior numbers from both sides of the plate and might end the Rays platooning outfield spots in the near future. And you got to give Rays Director of Scouting R J Harrison and Rays Director of International Relations, Carlos Alfonso a huge double high-five on their department’s Black Ops work to go totally on the deep down low and stay completely off the baseball radar with possible baseball workouts with Anderson without causing any sort of attention being focused towards the Rays or Anderson taking place this Spring. And you know it was not a small group of Rays staffers’ involved in trying to keep this quiet, but it still amazes me time after time how the Rays have been so silent until they finally announce their signings without a lot of rumor chatter. The usual rumors that have been played have come from the other player’s reps or agents and not from within the Rays office. That in itself is amazing to me. But this is the path that baseball is beginning to take with instant communications by a bevy of options available at our fingertips. With the addition of instant video conferencing even by cellphone now, baseball workouts can be broadcast back to team officials on a constant stream of video while the players participate in hitting, or even fielding in an arranged simulated game. And maybe the Rays might be viewed as ruining the trade system by staying tightlipped before getting a player’s John Hancock on the dotted line, but in essence, if that is what it takes to get the job done, then I am all for this new Rays personnel mentality. 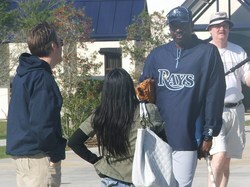 Anderson’s signing was not expected by most of us following the Rays this Spring. Most of us within the Rays Republic thought the team was slowly reeling in Ruiz towards finally signing with the Rays instead of hauling in another big fish like Anderson. Reality is that the Rays could still maybe also sign Ruiz in the near future as another future fixture to combat high payroll concerns. 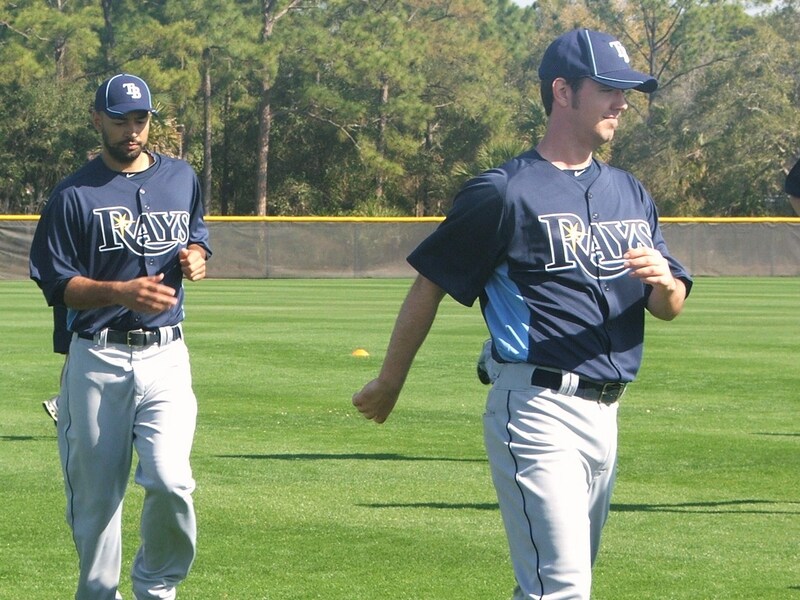 And both players effectively co-existing on the same Rays roster should bring a level of excitement to Rays fans. And maybe that is another unsung victory for the Rays scouting department and office staff in not only getting Anderson signed, sealed and delivered, but covering it all in a cloak of mystery, which is really impressive. Who knows to what extent Anderson will benefit the Rays in 2010, but you know he will have a definite imprint on future Rays squads, and maybe a possible new competition battle in the Spring of 2011 as he makes his mark within the Rays farm system. Looking at both the positives and negatives of both players, the Rays might have picked the one total package multi-dimensional player who will not bring both a sense of drama and uncertainty instantly towards the Rays franchise’s system. 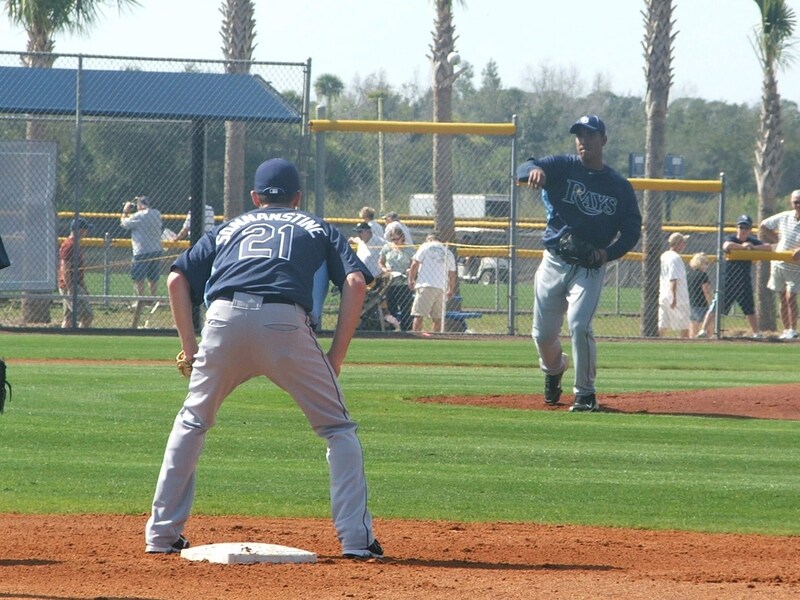 It is still too early to project any possible scenarios for Anderson, but I could see him being assigned to either Double-A Montgomery and worked out at first base, and then begin his rise through the Rays system with a possible MLB debut date in Tropicana Field maybe in September 2010. And if he does get to the Major League level in 2010, could Anderson be one of those late season additions that propels the Rays again towards the Playoffs. 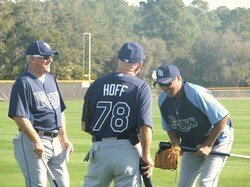 This might not happen, but I like to be optimistic when I talk about these 2010 Rays. Because I really feel another “Magical”-type season brewing under the surface and this Anderson signing could be a great ingredient to the total mixture. You automatically got to like this kid. Really you have to, it is a moral imperative within the Tampa Bay Rays culture that when you give up a great left-hander like Scott Kazmir, you got to get to know his replacement, and at least give him a few games to settle into his new spotlight before you condemn or pledge your loyalty to them. 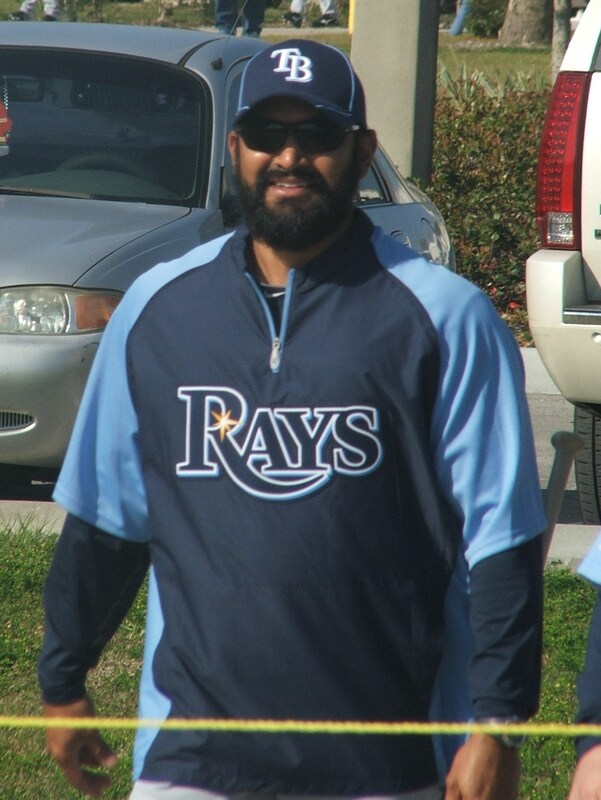 Well, ladies and gentlemen, if the last couple of Rays Spring games is any indication, Sean John Rodriguez is already cool as a cucumber and slick as a fox, and an instant fan favorite. And believe me the cliché’s are going to coming fast and furious if he does find a way to steal this last coveted roster spot away from the Johnson & Johnson brothers , or his close competitor, Reid Brignac. But if you base his total roster chances on just Rays games over the last few days, it might actually be more like, when he steals that roster spot away. And it is not like he has not been in this kind of pressure situation before while fighting for a Major League spot. Rodriguez has spent a bit of time in the Big Show before when he was with the Los Angeles Angels, so this is not his first rodeo. 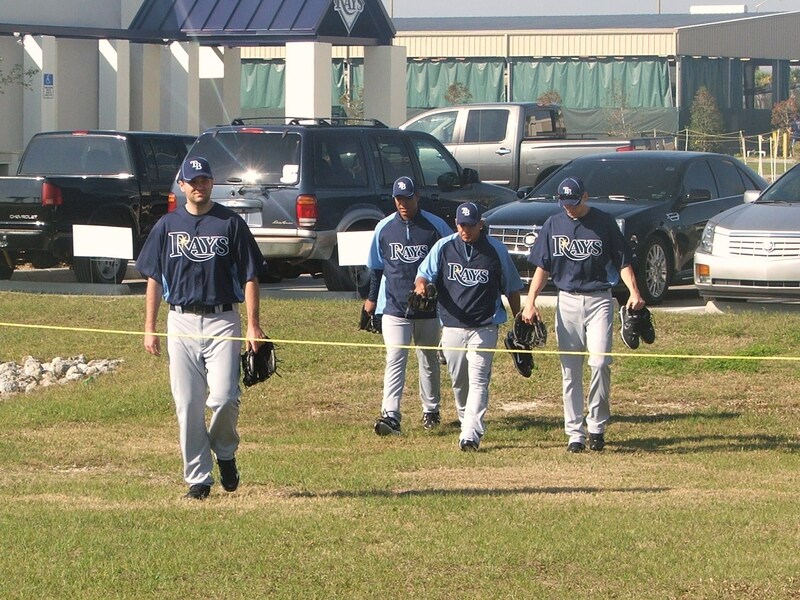 And that might be a side of Rodriguez we truly had no idea about before this 2010 Rays Spring Training season began. Most of us Rays fans might not have noticed the young guy manning the second base bag during the Angels first visit to Tropicana Field from May 9-11,2008 was the same Sean Rodriguez. And we definitely did not notice Rodriguez sitting in the Third Base Visitor’s Dugout at Tropicana Field after being called back up from the Salt Lake City Bee’s when the Angels went through a rough patch with multiple infielders going down with injuries in early 2008. And there is an eerie set of similarities to his Spring start here in 2010, that might bode well for him making this team’s roster, if you really look at the numbers. Back in Spring Training 2008 with the Angels, Rodriguez hit only one single in his 11 Spring Training games while hitting a double, a triple and solo Home Run with 3 RBIs. It is just a bit of an odd coincidence that he currently sports no singles while pushing a double, triple and 3 Home Runs across the board this Spring in three games for the Rays. Maybe it is a baseball omen to us to watch this guy over the next few weeks. But this impressive start at the plate has also given him a bit of a quick jump on Brignac, who also is trying to keep up with the white hot Rodriguez, and it is going to be a complete thrill to see which of these hitters blinks first and let’s the other get a bit of an advantage in their race for the last utility spot on the Rays 25-man roster. And Rodriguez knows a lot about these Rays from his 5 game played against them in 2008. He was the field for all three games during that early May series when the Rays swept the Angels here, and was witness to seeing the Rays eventually winning 6 out of their 9 games against Angels that season. 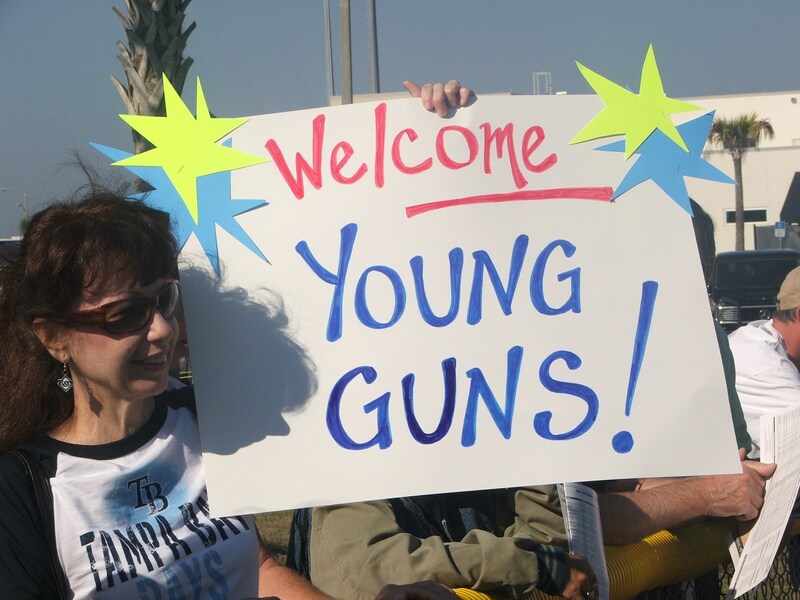 But even more telling that Rodriguez might be developing the emerging cult following, not unlike fellow Rays infielder/outfielder Ben Zobrist with the instant accumulation of inspired nicknames that are beginning to be heard in the stands at Rays Spring games. Already we have heard at least two nicknames rushing to the forefront, with one really taking a quick liking to him. There has been the “S-Rod” moniker which might have evolved more for his recent rush of power and uncanny ability to brush off the media attention, or maybe the one I heard at George M. Steinbrenner Field yesterday when someone asked “Sean John” for his autograph. The last one actually had me chuckling a bit because I was looking over my shoulder for one of those goon interns of Sean “P. Diddy /Puff-Daddy” Combs instantly coming out of the woodwork trying to smash the “alleged” trademarked name infringement “Sean John” down into the clay of the infield and quickly silence that moniker from the lips of autograph seekers on the rails that game. But there was no lightning quick response to the name, and I actually think Combs would be proud to share that patented name with a young baseball guy who just might have the style and panache to pull off a theft of this second base job and roster spot without much of a hitch. Heck, maybe if Rodriguez keeps this up he will have a Fed Ex package waiting for him with some signature Sean John wear inside them…You never know. But seriously, this second base gig is going to be one of those spots in this 2010 Rays squad that you either own or rent in 2010. If Rodriguez makes it difficult for Rays Manager Joe Maddon to not pop his name on the lineup card in marker, he might just be an inter-changeable piece along with Zobrists and his traveling glove collection in 2010. But some people worry that Rodriguez has only played third base and second most of his professional career, and has not concentrated his efforts toward maybe relieving Rays starter Jason Bartlett at some point in 2010. Again, this might be one of those finer points that Brignac has shown he can be effective at that position that makes this competition go long into Spring Training. And even if most people have not seen Rodriguez play the outfield, he did play leftfield against the Yankees on Friday and looked pretty comfortable out there. But then again, he did play a lot of outfield in his All American High School career. 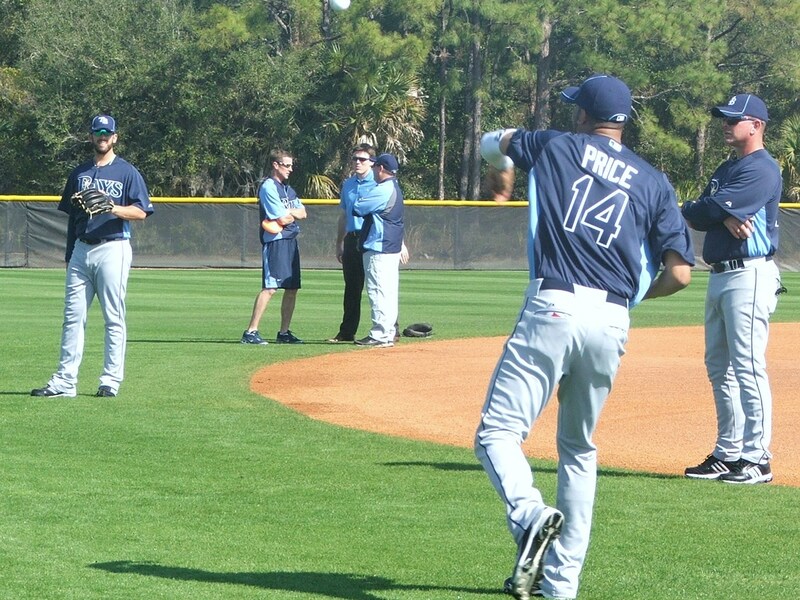 This entire competition between Rays Spring Training invited players to hold a competition for that coveted last spot in the Rays roster for a infield slot is quickly becoming a two-man affair. Elliot Johnson is doing everything he can to get his name included, but Brignac and Rodriguez are putting on a show at the plate and in the field that is dwarfing everyone else right now. 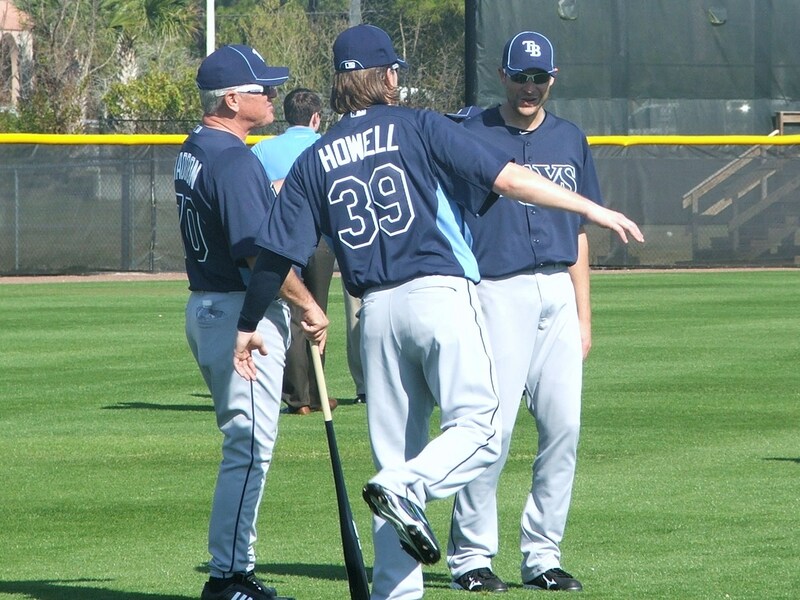 And if either of these two can force Maddon’s hand in the next week or two, this competition might even be over before the Rays take on their Triple-A affiliate, the Durham Bulls in a friendly match up in Durham, North Carolina on April 3,2010. Some have questioned Rodriguez’s lack of full season experience to only a total of 71 career Major League Baseball games and a regular season average of only .203 with 8 doubles, a triple, 5 Home Runs and 14 RBIs. That could be a instant pause for Maddon and the Rays to consider, but Brignac also has only appeared in 35 Rays game and has only produced a .250 batting average with 8 doubles, 2 triples, a solo Home Run and 6RBIs. This race is far from over, and it might come down to the Rays deciding if they want power or consistency in their hitting out of this spot in 2010. If they take the power angle, Rodriguez would get the early nod, and even based on experience, right now might be the guy who has the most to lose with a few bad outings. Sean Rodriguez is a great budding star that could play a significant role for the Rays if he develops the way they want him to over the next few weeks. If he does, then he will definitely be in that Rays Opening Day lineup, and hopefully we can get him an appropriate nickname that might not upset a fashion icon, or even a certain player also in this division sporting the A-Rod moniker. But if Rodriguez keeps playing and producing at this level this Spring, then maybe they would not mind sharing some homage time with a guy who could help lead the Rays on the field. 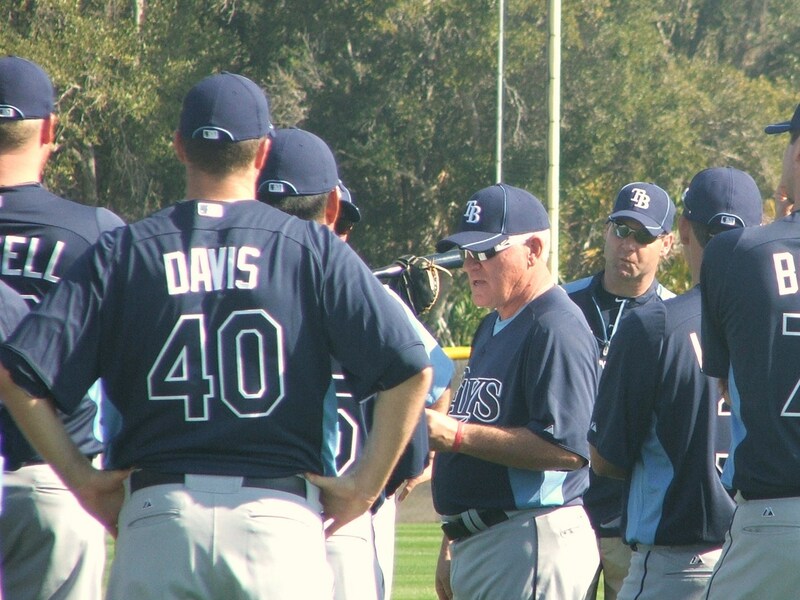 I remember back in 2008 seeing him standing right next to Akinora Iwamura during the Rays Team Photo. Standing there was this Rays player who is now fighting for his professional life, not even an arm’s length to the right of me, but I really did not know the first thing about Elliot Tyler Johnson at that moment. Johnson was one of those Rays players who had begun the 2008 season teetering on the edge of the Rays 25-man roster and was within an injury or a recovery away from again falling into the Rays farm system…again. You have already known that Johnson has spent only a total of 28 days with the Rays after making the 2008 Opening Day roster following a blistering Spring Training, combined with Rays utility man Ben Zobrist’s 15-day Disabled List visit with a fractured thumb, Johnson firmly earned his first shot up with the big club. But his time in the Majors was short lived as Johnson appeared in 7 Rays games before disappearing again back to Triple-A Durham, where he spent the rest of the 2008 season. 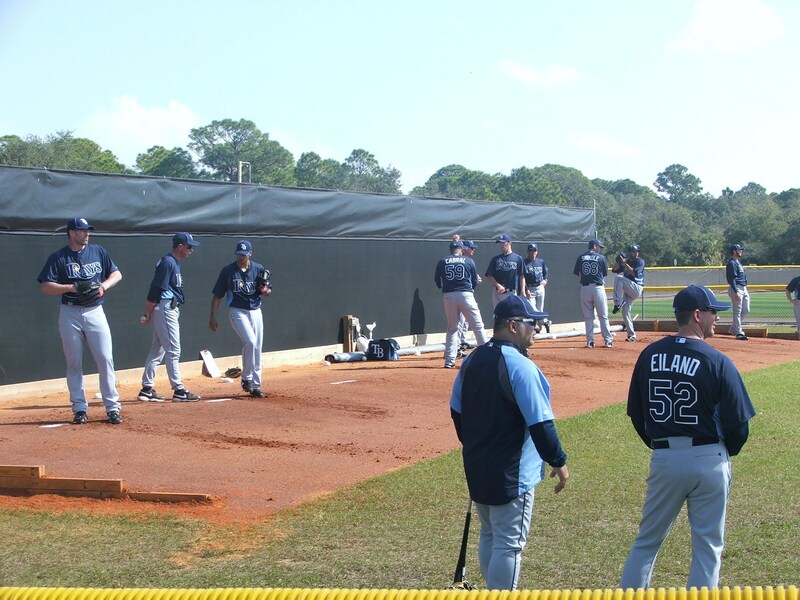 I had forgotten how not even a month earlier, Johnson had made his Major League debut in the holy confines of Yankee Stadium on April5,2008 in only the Rays fifth game of the season when Johnson got his first chance to show what he could do for this Rays squad. Johnson was that night’s Designated Hitter, and was popped into the ninth slot in the lineup. And I somehow had forgotten that Johnson did get his first Major League hit off Andy Pettitte in Johnson’s second at bat, but maybe I brushed the moment away because Johnson then got picked-off first base by the crafty left-hander. Not the first guy to have that happen to him, but not also a great moment to show weakness in your talents. Rays decided to bring up another infielder Andy Cannizaro, Johnson had only appeared in 5 Rays games and batted only .158 ( 3-19) , but in an instant, Johnson was gone again. And it is a bit of a crime that I have not taken the time to learn more about this guy who won the 2008 Al Lopez Award as the top Rays rookie during Spring Training, or who scored 17 runs and led the Rays 2008 Spring Training team with a .417 batting average and got 23 hits while logging an astounding 117 Spring Training innings. And how most of us within the Rays Republic knew his name only after maintaining the 2008 Rays team mantra of always hustling, even during the Spring Training games, when Johnson came in hard on Yankees rookie catcher Francisco Cervelli on a play at Home Plate during the 9th inning of a Spring Training game against the Yankees at George Steinbrenner Field, and ended up fracturing Cervelli’s right wrist. He instantly became a villain to Yankee fans, and a reincarnation of Pete Rose to the Rays Republic. Instantly he became the Rays Spring Training poster child for taking advantage of his game opportunities, but Johnson also became an instant scapegoat from other teams’ who condemned his Spring Training hustle because it was only Spring, and it cost another team one of their bright stars so early into the season. Instantly people forgot the great feat Johnson performed on May 28,2004 when he blasted homers in his first three at bats while playing for the Charleston RiverDogs in their first three innings of play that night. Johnson had started his minor league career with only three total home runs before that night’s breakout performance against the Greensboro squad. As a side note, Johnson had homered in his last at bat the night before in Greenboro, effectively hitting homers in his last four at bats for the RiverDogs. And before B J Upton hit his cycle with the Rays in October 2009, Johnson was the last Rays organizational player to hit for the cycle when Johnson hit his cycle on September 15,2006 while he was playing with the Montgomery Biscuits. Johnson was one of those guys who has more than paid his dues within the Rays farm system, but we as fans, discarded him for some reason without a second thought. And during this 2010 Spring Training season when the Rays are seeking a versatile utility guy who can play multiple positions, Johnson might be finally entering into his final sunset with the Rays. Johnson no longer has any minor league options left in 2010, and Johnson could effectively be gone either by the Rays placing him on waivers, or Johnson could be dealt in a late Spring trade ,and gone from the Rays for good. 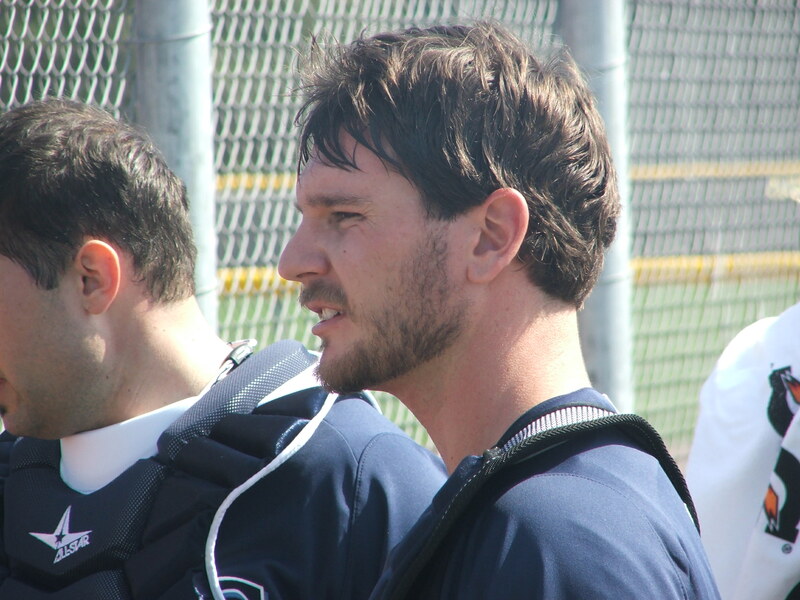 And even with only two games down in the 2010 Rays Spring Training schedule, Johnson went 1 for 2 today with a triple and scored on a single by outfielder Matt Joyce in the bottom of the ninth inning to defeat the Baltimore Orioles 6-5 today in Port Charlotte, Florida. Johnson is still trying to get his name into the Rays organization’s minds this Spring, and hopefully get another chance to show he belongs at the Major League level. 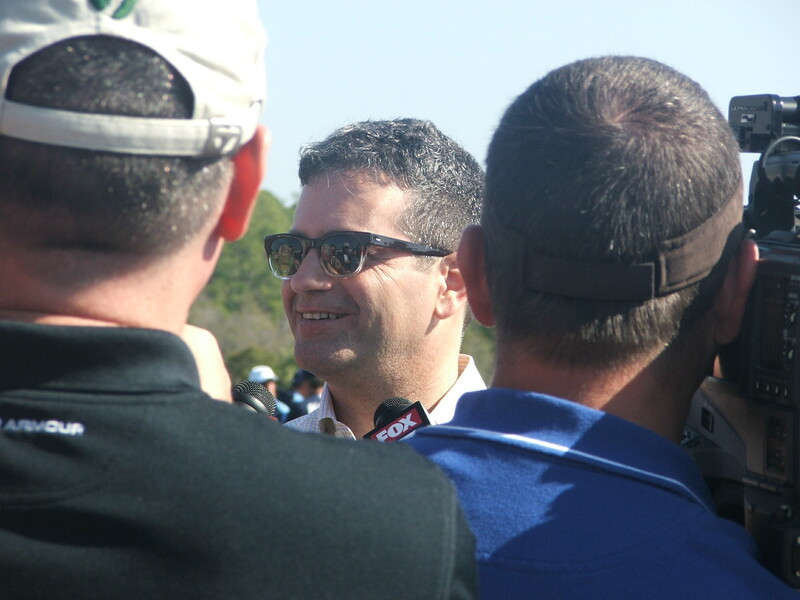 I do not think I am alone here within the Rays Republic in not taking the time, or the energy to chat it up with Johnson along the Rays sidelines this Spring. And I am totally guilty of not taking advantage of this opportunity in the past, almost forgetting at times that Johnson was even here for Spring Training. Johnson is like so many guys among every Major League Baseball Spring roster who is not invisible, or even unapproachable, but might be caught in that middle ground of players that we always think will be a part of our teams. He always seems to do enough to stay on long into the Spring Training schedule, and we feel they might make that leap again, and you don’t give it a second thought that players like Johnson can be gone in an instant. And you maybe would not even have recognized Johnson out and about within the Port Charlotte community, or even up in Durham, North Carolina where he still makes his home during the off season. Or that Johnson has conducted local baseball camps for the last three off seasons for the kids and teens of the Durham community, where Johnson also instructs students in one-on-one baseball lessons. Or that Johnson comes from the community of Thatcher, Arizona, which was the backdrop of the Albert Brook’s movie “Lost in America”. Johnson is simply one of those guys who has fallen through our mind’s cracks and might be getting his last chance in 2010, to make this Rays team soon. For some reason, baseball fans sometimes seem to get a bit of tunnel vision during Spring Training where we funnel our attentions towards our team’s stars and the aspiring prospects, and we instantly forget the players like Johnson, who have been there for so long trying to grab a hold of a chance to get back to the Major League level. 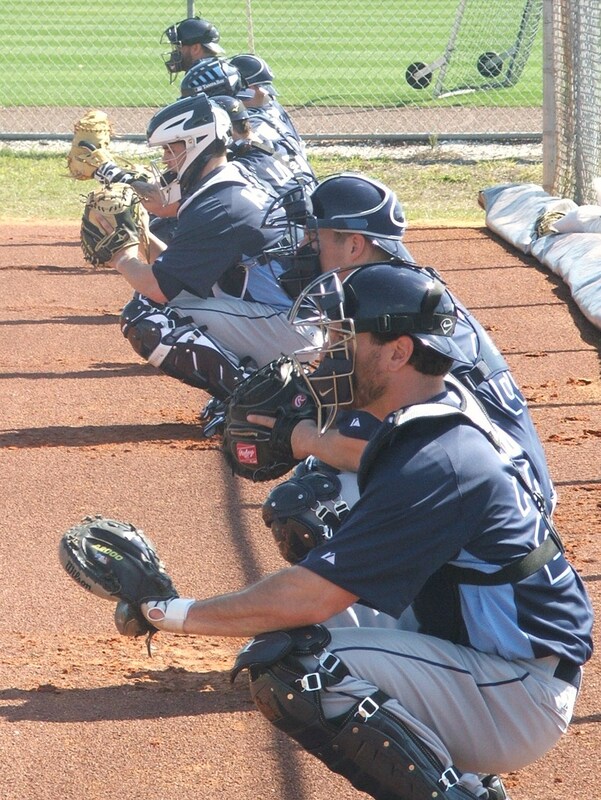 And Johnson has been with the Rays since the team signed him as a non-drafted free agent back in 2002. 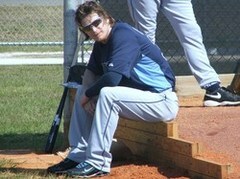 So it is not like he just rode into this Spring into his first run with the Rays franchise this Spring. Johnson has been here so long that some of us, myself included, have made him a bit invisible to ourselves over the last few seasons. And that is a crying shame because this is the type of guy we should be cheering for ,and wanting to see make this 2010 Rays club. And Johnson is not alone on this squad in that manner. People forgot a bit about another long-time Rays farm hand Justin Ruggiano. 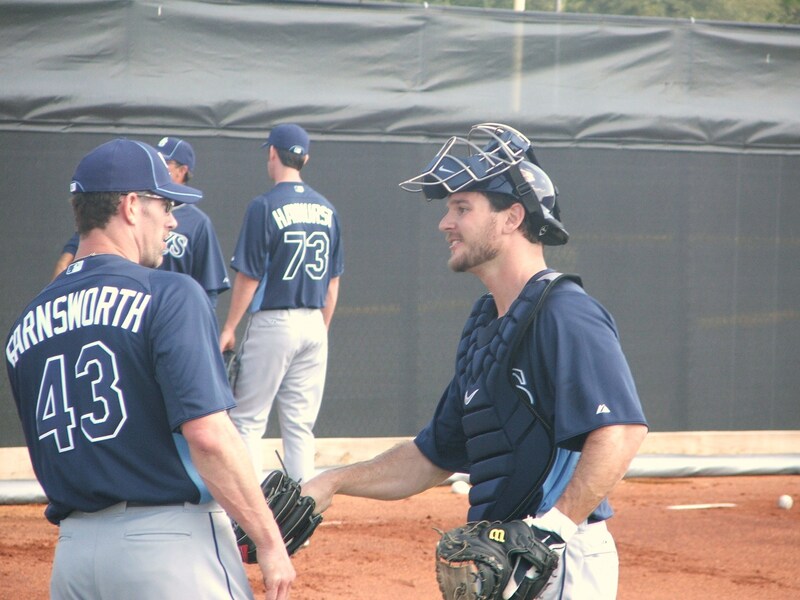 But you can bet that on Sunday, when I hit BrightHouse Field for the Rays versus Phillies game in Clearwater, I am going to try and call over Johnson and wish him the best this Spring. Finally, I am going to try and get a chance as a Rays fan to get to know Johnson before he might be gone. And maybe, just maybe, I could then call him over again on April 6th ,before the Rays take on these same Orioles in the Rays Home Opener, and Johnson would be smiling ear-to-ear while still sporting that # 47 jersey…. just like today. 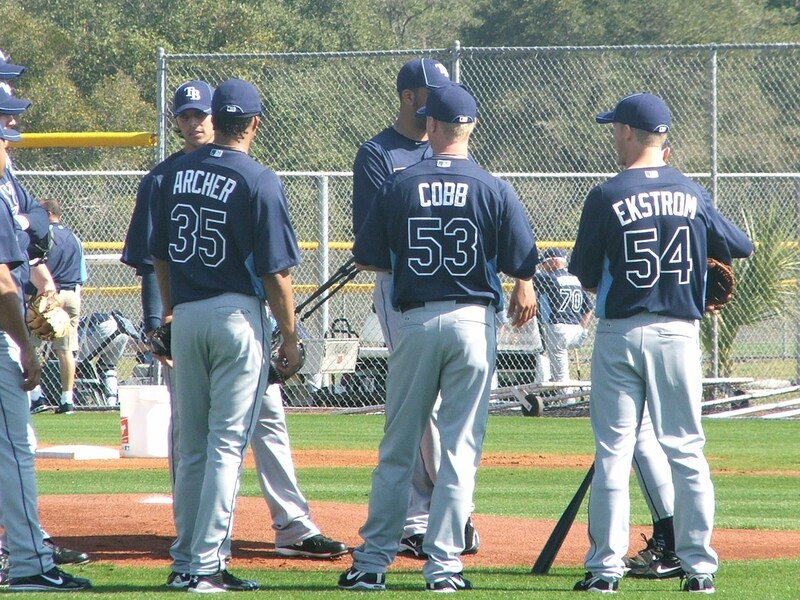 Can Winston Abreu make the Rays Roster? 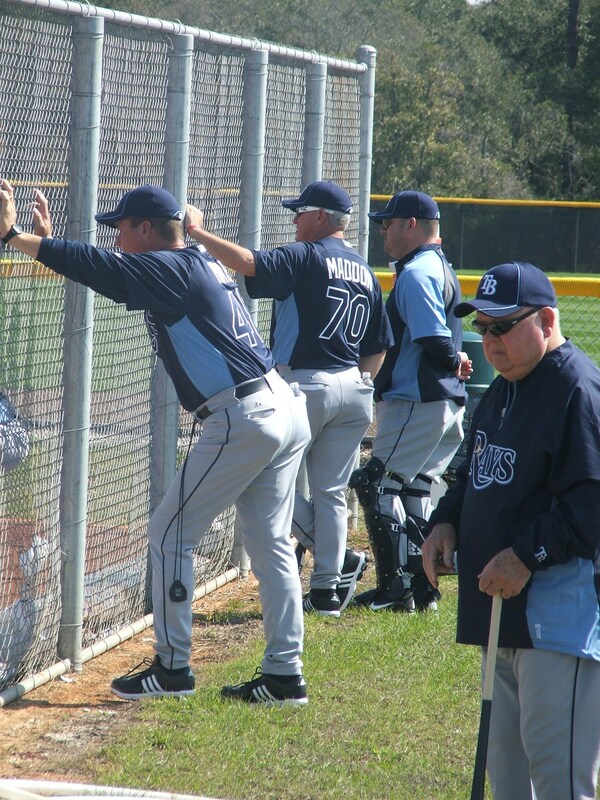 Coming into the middle of February in 2010 when the Tampa Bay Rays pitchers and catchers begin to report for Spring Training in Port Charlotte, you have to realistically visualize the picture that there might only be one lone slot left on the Rays 25-man roster for another reliever. And considering this Spring invitees will include Durham Bulls relievers like Randy Cromier, Dale Thayer and Calvin Medlock, there is still one name missing off this list who I think might have a real legitimate shot at securing that solo seat on the Rays Bullpen bench for 2010. Sure, we can debate back and forth for days as to the merits of the other three guys I have mentioned, or a even the merits of other relievers currently on the Double-A Montgomery Biscuits roster who could also make some huge advances and impressions both the field and in the minds of the Rays organizations Coaches minds by the end of March 2010. And the one name missing from this group is Winston Abreu. I think that Abreu has the stuff on the mound and the acquired veteran wisdom needed to secure his first Opening Day roster spot of his 14-year professional career. Sure some people will certainly point to his extended journeyman minor league career with only two prior Major League promotions to the before the 2009 season with the Baltimore Orioles (2006) and Washington Nationals (2007) as a bit of negative fodder that his name should not even be uttered with such confidence. But then again, in all of his past promotions to the Major League, he has been a stop-gap guy filling in for a veteran persence missing on that Major League roster, and that shows you teams knew he had the abilities. 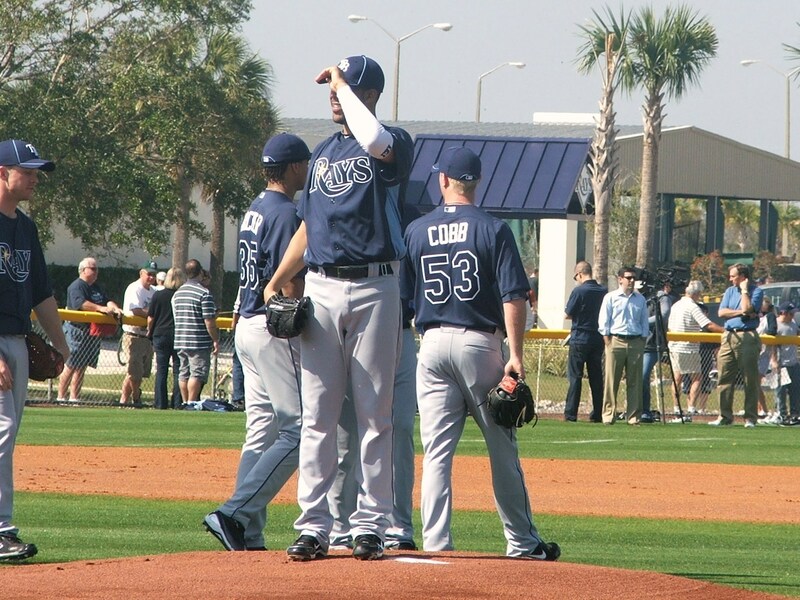 But again, in 2009, Abreu did appear to fill that same type of gap for the Rays securing a limited role with the Rays Bullpen after the team put veteran reliever Jason Isringhausen on the Disabled List on June 14th and only gave Abreu two appearances before designating Abreu for assignment after veteran reliever Chad Bradford was ready to rejoin the Rays Bullpen after an injury. And sure you can also throw the added negative bonus of the Rays then trading Abreu to the Cleveland Indians on July2,2009 and Abreu only spending about a month on the Indians roster before they also designated him for assignment on August1,2009. But Abreu quickly rebounded and signed with the Rays again and was sent to the Triple-A Durham Bulls for the second time during the 2009 season. And within 30 days of Abreu rejoining the Bulls, he was selected as the International League Pitcher of the Week for August 30th after only surrendering 1 lone hit in his last ten appearances of 2009. And even if Abreu’s stats while pitching with the Indians held up a gaudy 23.14 ERA for the whole baseball world to see in his only three appearances for the Tribe, most people around baseball seem to remember his actions during a July 27,2009 game at Safeco Field. Abreu took the mound in the ninth inning after Mariner’s starter Chris Jakubuska’s hit Ben Francisco square in the back with his first pitch after surrendering a 2-run homer to Asdrubal Cabrera earler in the top of the ninth inning. Abreu countered in the bottom of the ninth inning with an action that should happen according to the unwritten rule book of baseball and plucked M’s Third Baseman Jack Hannahan. Sure both benches and Bullpens’ cleared and came out onto the field, but order was quickly restored and the game started up right after the Home Plate Umpire ejected Abreu because of the retaliation pitch. Abreu was subsequently given a 3-game suspension for his part, along with a fine for good measures. Most people would see that as a negative blemishe on a pitcher’s mental make-up to try and incite a brawl, but I actually see it in a different light as a veteran pitcher understanding the unspoken code of the game, and doing the right thing for his teammate. But the main reason I think that we will see Abreu make this year’s Rays 25-man roster might have come about with MLB.Com naming him the Triple-A Reliever of the Year after posting a 3-1 record with a 1.94 ERA during 37 appearances for the Bulls last season. That might have been the cherry on top of that Triple-A Championship sundae. But with abreu coming back to the Bulls after his Indians disaster and showing his rubber mental consitution by getting 15 saves, you can see Abreu as a reliever who has that proverbial ice water in his veins that the Rays seemed to be missed most of last season. 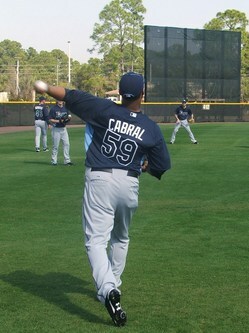 Abreu has that veteran mustard and wealth of past experience that the Rays Bullpen will need during their 2010 season. And sure he might have a few quirks like carrying his glove with him to the Bullpen restroom during his time up with the Rays, but the guy truly understands the game from A to Z. The Rays farm system has a bevy of ample arms sitting down in the minor leagues, but they do not have any relievers with prior Major League experience besides Thayer and Abreu right now. When the Rays resigned Abreu on December 14th, I felt they made the move for his expertise, not as a reward for winning a Triple-A title or a post season MLB.Com award. The guy has take a long journey through the farm systems of the Braves, Cubs,Dodger, Diamondback, Orioles, Nationals, Indians, Royals and now the Rays during his career. 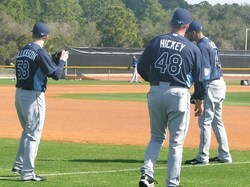 And the abundance of knowledge he has as a veteran pitcher could be a valuable asset in 2010 for the Rays. I mean if he was such a middle-of-thepack reliever, then how did he pitch for Bobby Valentine’s 2008 Chiba Lotte Mariner’s squad over in Japan? You know Valentine stresses pitching on his teams. So coming into this Spring, I am going to be watching Abreu to see if he is one of the guys to get a lot of reps in Spring Training contests. Last season Abreu made it all the way up with the Rays Spring Training roster until March 16th when the Rays sent him to the minor league camp also located in Port Charlotte, Florida. 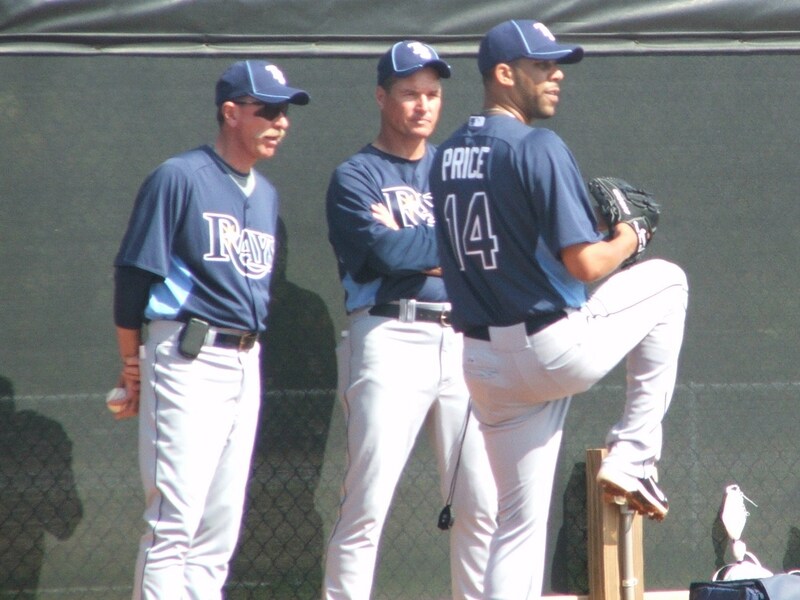 Hopefully during this this Spring Abreu can make a lasting impression on the Rays Spring Training coaching staff to get a chance to stay and earn a roster spot. Abreu has everything you want in a reliever at the major league level. Abreu has pitching ability, the vast experience and a yearning to succeed at the highest level of the game. revolve just under the surface around the game of baseball. I guess all Abreu needs now is a chance on the mound to show he should be one of the last decisions of the Rays this Spring, and be sitting on that Rays Bullpen bench watching the first pitch of the 2010 season.